Discussion in 'Free Speech Alley' started by uscvball, Feb 3, 2019. Surprised nobody has brought it up yet. Anyone here really believe his story? I don't for SO many reasons. 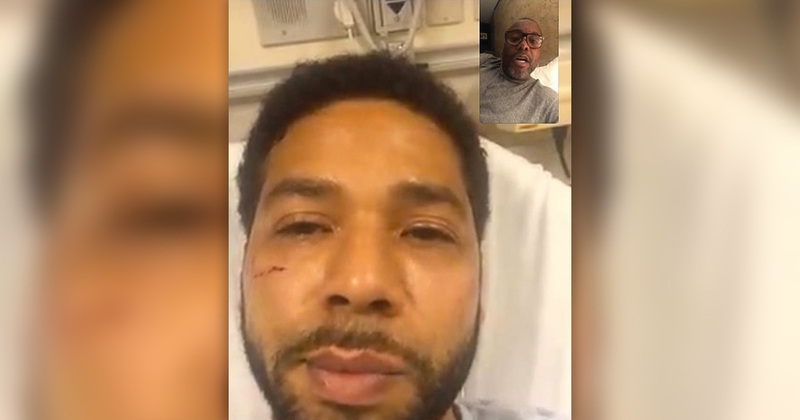 It might seem like a small detail, but police noted that Smollett still had a grip on his Subway sandwich despite the attack." Who goes out at 2AM in subzero temps for a freakin Subway sammich? Especially if you are an actor with an agent and the ability to use GrubHub or UberEats? Anyway, some of the comments about the sandwich are hysterical. You can have my subway when you pry it from my cold dead hands"
Huge commitment to hang on to that Subway sandwich after being beaten, bleached, & having neck roped. He could be Subway’s next spokesperson!" If I was out rolling around committing heinous crimes at 2am in a snow storm I’d at least steal the sandwich when I was done. Unless it had pickles on it those are gross"
Of course those are humorous, much different than Jussie's tweet to Trump last month. And he does wear some cool T-shirts. He must be a ninja warrior though. For getting beat the hell up by 2 dudes, he didn't have much to show for it. But the police do have a picture of 2 "people of interest". Winston1 and Frogleg like this. Lol, i didn't know about the miracle save of the sandwich. Even before it seems like something is seriously amiss at the Circle K with his 'story'. c) Let me remind everyone what kind of country we have because of TRUMP. I'm going with "D". Either that or if he's telling the truth, those are some committed lynchers. Clearly they are the only 2 Trump supporters in Chicago and it was subzero...walking around at 2AM with chemicals and a rope? There are very few things a man will go out in those conditions for and a Subway sammich isn't one of them. Jussie was after some strange. Maybe a Craigslist hook-up gone wrong. His agent claims they were talking on the phone at the time of the attack and he heard the MAGA claims. But of course, despite being asked by the police to turn over his phone, Jussie hasn't complied. And he had the noose around his neck some 45 minutes later. What black man is going to leave a noose around his neck for 45 minutes? There are very few things a man will go out in those conditions for and a Subway sammich isn't one of them. Jussie was after some strange. Good thing not all women understand how a man’s mind works as much as you do. ROY_LA_CA and Bengal B like this. ROY_LA_CA, HalloweenRun, shane0911 and 2 others like this. It sad this BS even makes the news! There have been several MURDERS of law enforcement officers in N.C. since the start of the tear, nothing on national media. Regardless of who did it, you'd have to be a complete retard to go walking alone in Chicago at 2 am.